Many of the uses of corticosteroids in medicine are based on their anti-inflammatory power. This effect can be harmful in those clinical situations in which the inflammatory process needs to occur, such as in the first phase of healing of an acute wound. As mentioned in previous entries, chronic ulcers are characterized by a prolonged inflammatory phase, characterized by increased cytokines and metalloproteases, with the consequent destruction of the extracellular matrix and decreased growth factors in the wound bed. Therefore, the use of topical corticosteroids, by reducing inflammation, could be beneficial in breaking this vicious cycle. However, the potential risk of infection associated with its application in a chronic wound, which usually has a high bacterial load, should be also taken into account. Although the use of topical corticosteroids is a widespread practice in the management of chronic skin ulcers, it stands out the lack of clinical trials that can support their efficacy and establish their indications. A retrospective study of chronic recalcitrant skin ulcers with excessive inflammation treated with a topical preparation containing a steroid (clobetasone butyrate 0.05%), antibiotic (oxytetracycline) and antifungal (nystatin) has recently been published. Healing rates were calculated for before and during this treatment period for each patient. Of the 34 ulcers treated, 24 showed accelerated healing, 3 had no changes, while 7 suffered a slowdown of the healing process.2 Among the limitations of this study, we should highlight the lack of a control group, the etiological variability of the lesions, the subjectivity to define an ulcer with excessive inflammation (inclusion criteria) and the lack of record of other dressings or compression therapy used. In daily practice, it is common to use a moderate-high potency corticosteroid. We regularly use betamethasone dipropionate. On a thick layer of cream, depending on the exudate and the location of the wound, we usually place an interface dressing, sheet of calcium alginate or a foam. In cases of very exudative wounds, instead of applying the corticoid in cream form, we use its presentation in aqueous suspension, which we apply by soaked gauzes in each dressing change. 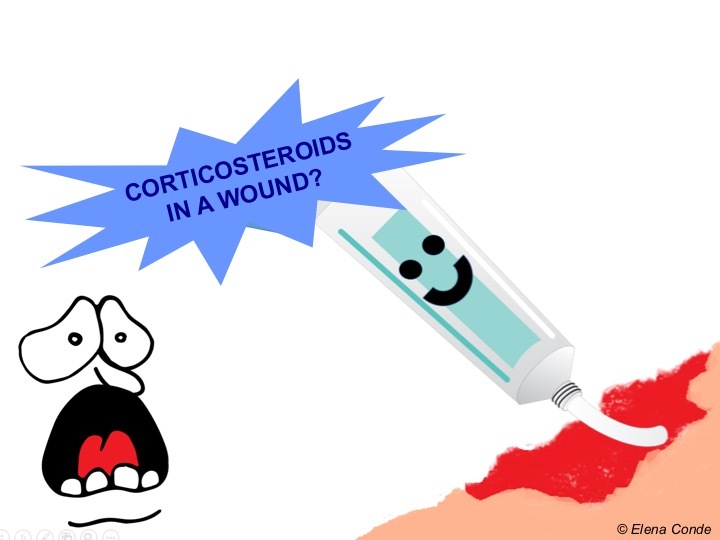 As mentioned above, there are no consensual indications for the use of topical corticosteroids in wound healing. 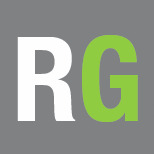 Its occasional use in cases of overgranulation is widespread. The published case series show encouraging results to extend its use in other recalcitrant chronic ulcers, which present with clinical data of excessive inflammation. 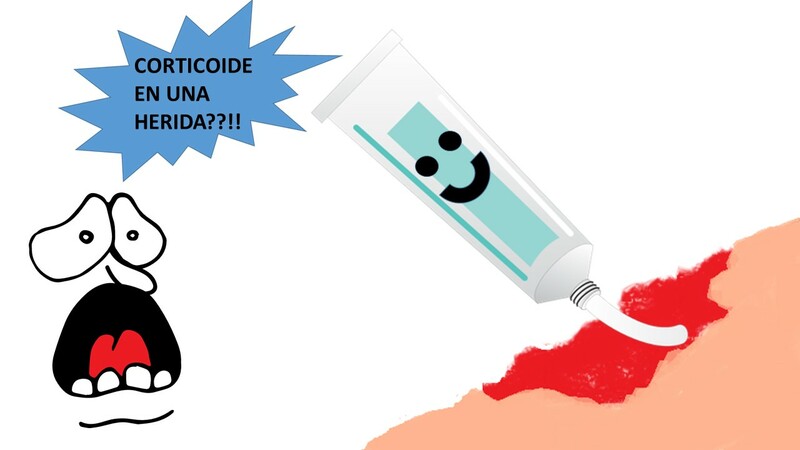 There is one type of wound in which topical corticosteroid is one of the first line treatments. This is pyoderma gangrenosum, a rare neutrophilic dermatosis characterized by the development of ulcers mainly in areas that have suffered damage (surgery, trauma, …). It may associate systemic diseases, such as inflammatory bowel disease, but up to 50% of cases are considered idiopathic. 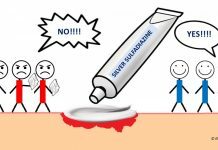 Systemic and topical corticosteroids are first line treatments, as they decrease inflammation, which is the cause of ulcers.3 If you want to read more about pyoderma gangrenosum, go to post “Pyoderma gangrenosum: a diagnostic and therapeutic challenge”. Cohen PR. Neutrophilic dermatoses: a review of current treatment options. Am J Clin Dermatol 2009;10:301–12. Bosanquet DC, Rangaraj A, Richards AJ et al. Topical steroids for chronic wounds displaying abnormal inflammation. Ann R Coll Surg Engl 2013; 95: 291–296. Hofman D, Moore K, Cooper R et al. Use of topical corticosteroids on chronic leg ulcers. J Wound Care 2007; 16: 227–230. 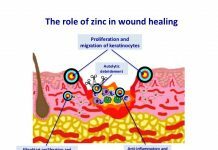 Why do we use topical zinc on wounds and perilesional skin?